Deputy Foreign Minister Hotovely meets Romanian Foreign Minister who says his country would consider moving its embassy. 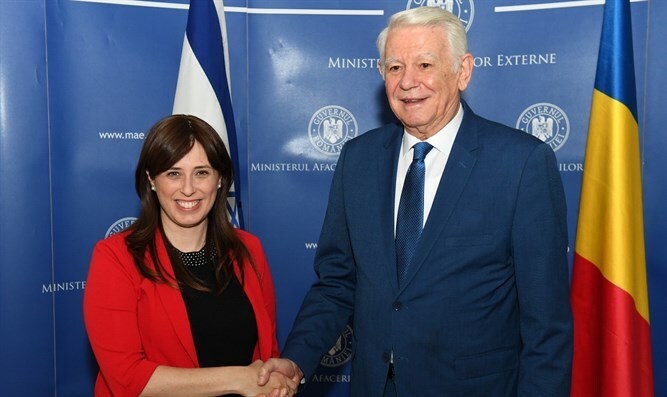 Deputy Foreign Minister Tzipi Hotovely met on Tuesday in Bucharest with Romania's Foreign Minister as part of her diplomatic campaign to promote the transfer of foreign embassies to Jerusalem. The Romanian Foreign Minister responded by saying that his country would assess the situation and positively consider the issue of moving its embassy to Jerusalem. In December, the leader of Romania’s ruling Social Democratic Party, Liviu Dragnea, said that the country should “seriously consider” moving the Romanian embassy in Israel to Jerusalem for practical reasons. The comments were made after the United Nations General Assembly backed a resolution criticizing U.S. President Donald Trump’s decision to recognize Jerusalem as the capital of Israel. Romania abstained from voting on the UN resolution, one of 35 countries to have done so. During Tuesday’s meeting between Hotovely and the Romanian Foreign Minister, an emphasis was placed on the continuing diplomatic relations between the two countries during the 70 years of Israel's existence. Hotovely also addressed the Iranian issue at the meeting and said that "the fight against Iran's nuclear program alongside the fight against terrorism and the instability Iran is sowing in the region is the central security fight of the entire world."